The art of living, how much do you know about it? Is it how you live your life or the concept of living itself? It’s the latter, the concept and spreading the love. Live and let live; this is the basis of it. With that, we have the following art of living quotes to give you a better idea. Speaks up about the cruel world we live in. You have to fight for your very existence. One has to live well to die well. Understand them while you are among them. All it needs is to know what to hold on and what to let go. Sometimes, the only way it gets better is when you get used to it. You either run from them or learn from them. Stay tuned to the heavenly music and progress your way. Create memories; they are far more valuable than possessions. True living is learning to give to others. In the end, all that counts is how you perceive things. Cheer what you have instead of resenting on what you don’t. Enjoy growing old; most people don’t get this privilege. You just have to bear with the masses, no getting around it. It’s the choices that define you. Present is a gift; that’s why it's called the present. To love is to live; to live is to love. It depends all on you. Once again, it’s all in your mind. You don’t live to pay bills only. Always appreciate the small things. These things make us alive. 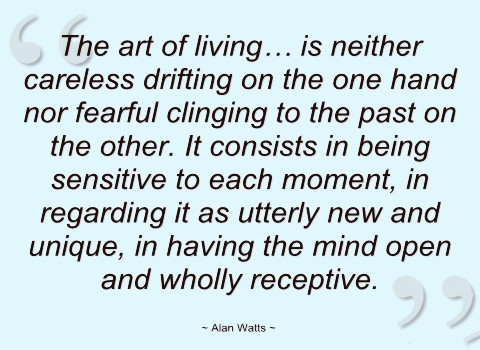 One of my favorite art of living quotes.